We had some friends over for dinner on Friday night. I had put out almonds, crackers, a mixed cheese plate and a basil/mozzarella/tomato Caprise salad to start off our evening. Crabcakes with a creamy tomato Creole sauce were the next course and then filet mignon with potatoes and broccoli were following. Dessert was chocolate covered strawberries and mini cannolli. Everyone wanted only red wine so we opened a bottle of 2005 to follow the 2006 Luna Cabernet Sauvignon Reserve from Napa Valley that we had already opened; this gave us the opportunity to do a mini vertical tasting. The two wines were very similar in color, aroma and flavor. 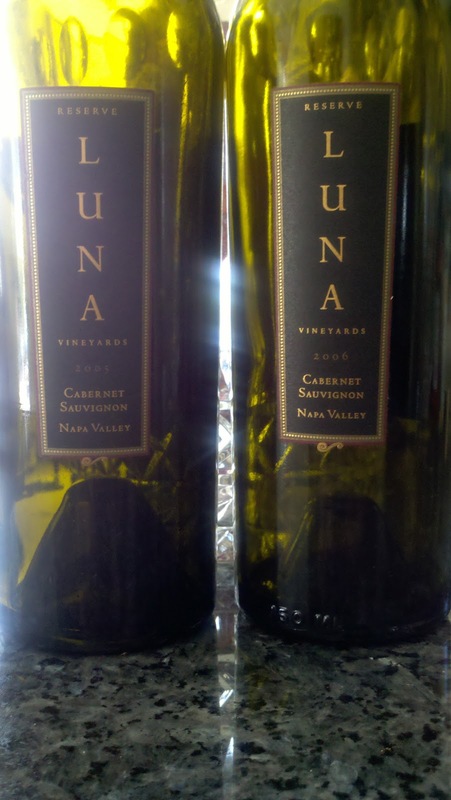 Luna Vineyards definitely does an excellent job of maintaining their style through different vintages. They were each a deep, dark ruby in the glass with a ruby rim. They had the typical aromas and flavors of blackberry and black cherry with some minerality and cedar notes. They were both well-structured and full-bodied with each having slightly over 14% abv and high acidity balancing dusty tannins. Both were absolutely delicious with a lingering finish. While there was not a group consensus on which was best, if I was pressed to choose, I would say that I had a slight preference for the 2006. It had a bit more fruit and spiciness with extra notes of licorice and allspice. Overall, I was very happy with both of the offerings from Luna.